The AUCOTEAM test laboratory conducts mechanical testing: Vibration, shock, wideband noise, sinusoidal vibration, vibration with temperature and humidity overlay, as well as vibration with temperature change and climate overlay at the accredited test laboratory. Our modern testing technology covers a large number of mechanical-dynamic testing needs. 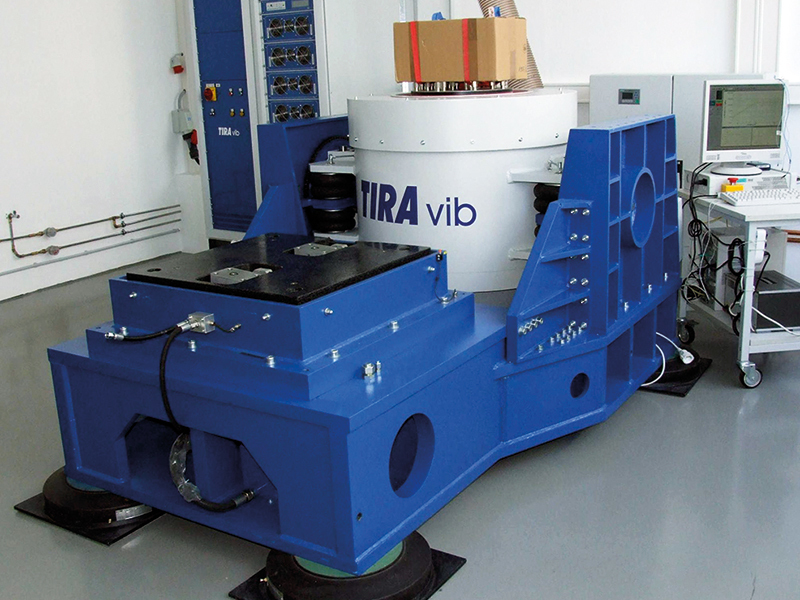 In our test laboratory we have 4 vibration testing systems at our disposal, each with different force and vibration capabilities. In addition to vertical loads, sliding tables are also used to apply a horizontal load to meet the requirements of use. Three of our “shakers” are fitted with a manoeuvrable climatic chamber. Combined testing with temperature and/or humidity overlay can be executed. We can advise you on the design of suitable clamping devices. The test sockets can be produced in our mechanical workshop.